ANDREWS AIR FORCE BASE, Md. 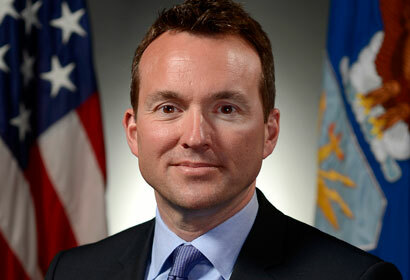 — U.S. Air Force Under Secretary Eric Fanning took over as acting secretary of the Air Force on Friday, becoming the highest ranking out, LGBT official at the Department of Defense. Fanning, who was confirmed by the Senate in April to become Under Secretary — the second-highest civilian position in the Air Force — will now serve as Acting Secretary due to the retirement of Air Force Secretary Michael Donley. Donley retired Friday after five years as the service’s top civilian; Fanning will serve as his replacement until a Secretary is nominated by President Obama and confirmed by the Senate. A career civilian Defense Department official, Fanning served as the Navy’s deputy undersecretary and deputy chief management officer since July 2009 before becoming Under Secretary of the Air Force in April. A graduate of Dartmouth College, Fanning has also worked on Capitol Hill during the Clinton years as a research assistant with the House Armed Services Committee and then later he served as associate director of political affairs at the White House. In service to the LGBT community, Fanning also served on the board of directors of the Gay and Lesbian Victory Fund from 2004 to 2007. In a recent interview, Fanning said that he hopes the Pentagon will adopt a non-discrimination policy to protect gay and lesbian service members. Fanning is responsible for the affairs of the Department of the Air Force, including the organizing, training, equipping and providing for the welfare of its more than 333,000 men and women on active duty, 178,000 members of the Air National Guard and the Air Force Reserve, 182,000 civilians, and their families. He also oversees the Air Force’s annual budget of more than $110 billion.